What is the reason when people prefer handmade table silver to machine made? Is it merely a sort of snobbery in people, complacent in the thought that they will not so frequently meet its equal, as they if they chose the prevailing machine made patterns? No, that is not at all the reason. If you have a pure aesthetic sentiment towards the utilitarian articles of every day, you chose the hand made table silver for quite different motives. Is there anything so pleasant as the feeling that a thing you have to work with is handy? Regard for once a joiner's tool, grasp it and notice the movement it is designed to make. You feel instantly that it fulfills its mission in a fashion which unites hand and tool in a higher unity. How is it that table silver is often so badly balanced? Simply because a machine makes a spoon of equal thickness throughout, and this causes it to be quite wrong in the hand. The silversmith who shapes his spoon quite independently of any machine, can divide silver so that the spoon becomes heaviest down towards the bowl and it is this which gives the pleasant sense of balance. Secondly, the silversmith can force a greater bulk of silver out into the edge of the bowl with his hammer than any machine is able to. The thick edge, which is later rounded, soft and fine, makes the spoon more pleasant to eat with - as opposed to the machine made spoons, the thin edge of which you often have a sensation of hurting you when you put it into your mouth. Finally, it deserves to be taken into consideration, that the handmade table silver in the long run is the most advantageous, because it is far stronger in use than the machine made. Table silver always has weak points, which only daily usage reveal. For instance, a fork is especially exposed on the piece where you place the forefinger when you thrust it into a piece of meat. The silversmith knows about the exposed places and takes care to make them especially solid, so that a breakage is avoided. 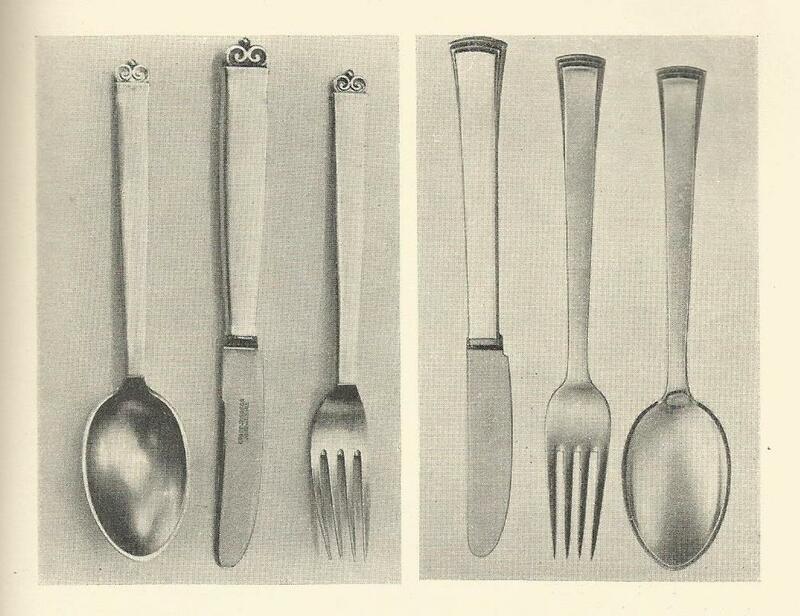 If we look at a spoon the mentioned edge is, of course, a good guarantee against wear and tear. It is no coincidence that several of his sets of table silver have been sold to distinguished American museums for arts and crafts. In his best work you perceive an urge to work with taught (sic. ), balanced lines, to have his effects clearly worked out without employing “picturesque” methods, where the process n the production is to draw attention to the finished work. There is every reason first to mention his work with table silver. Of this he has made several models. The first, No. 29, has been sold to the Gallery of Art, Omaha Neb. U.S.A. In 1931. The sweep of the handle is well designed in spoon and fork, but is less good in the handle of the knife, where it reminds you of a gnomes hat. In another, -No. 35, which has been sold to the Museum of Art, Providence, Rhode Isl., has been worked with quite smooth shapes and sliding, sweeping lines. The small notch between the handle and bowl which is probably reminiscent of the time when these two component parts were made separately has been removed there – you get an effect of hornspoons, the blade of the knife is quite short – but not too short. The top ends of the handle are perhaps rather sharp. Aage Weimar has worked a good deal with smooth basins, where the severe line of the side and possibly the curve of a cover gives the entire tension in the article. It is a very exciting and difficult art, not least in silver. Sometimes the entirely smooth motif has been enriched by the placing of a small flower, a leaf or ornament, or by combining several materials, so that handles for instance are made in ebony or ivory, the covered silver dish – which has been sold to the Gallery of Art, Omaha – is an example of this. The form of the small table bell, the handle of which is of ebony, is most elegant.